IBM z/OS® Version 2 Release 1 helps you minimize downtime and achieve higher performance and availability. But are you exploiting z/OS to the maximum benefit for your enterprise? 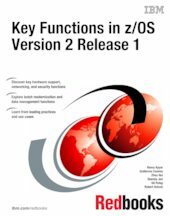 This IBM® Redbooks® publication focuses on some of the key features of z/OS. The focus is mainly on z/OS Version 2 Release 1, but key features from earlier releases are also covered. This book concentrates on enhancements in the areas of hardware support, communications, security, data management, batch modernization, and other selected z/OS functions. Each chapter describes what a feature is and the value it can bring to your business. Use cases help illustrate how each feature can be used, and leading practices offer advice on how to best take advantage of each feature. This publication is of interest to z/OS systems programmers, database administrators, network and security specialists, and anybody interested in learning how to better exploit the capabilities of z/OS.